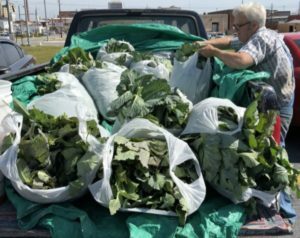 Thanks to the generosity of Limestone Creek Farm in nearby Hawkinsville, Georgia, the Macon program received a large donation of collard greens for the residents to enjoy courtesy of Limestone Owner Chris Fitzgerald (above). The Macon kitchen staff prepared fresh greens for all the residents and stored the rest in the freezer for later. Limestone also made donations to the Salvation Army and the Rescue Mission which provides shelter and meals to the needy. “We are happy to share the bounty,” said Director LaTonja Brown. “A diet rich in fruits and vegetables is associated with a reduced risk of many lifestyle-related health conditions and increasing consumption of plant foods, like collard greens, has shown to decrease the risk of obesity and overall mortality, diabetes, and heart disease.” The loose-leafed greens, which contain Vitamin A, B6, C and K, manganese and calcium, are part of the same species as kale and spring greens.